Charles Henry Jacques Johnston was born in 1962 in Selkirk, Manitoba. His dad Stan worked in construction and on bridges in Winnipeg. By the time Charlie started university he already had a fairly defined style that was already "pretty tight technically." He was more focused in the genre of fantasy art, which grew out of his love of comic books. Johnston graduated from the University of Manitoba with a Bachelor of Fine Arts in 1984. He went to Vancouver to see what was happening there and also went to Chemainus to see their whole Mural scene, and met Muralist Dan Sawatsky, who had a gallery there. 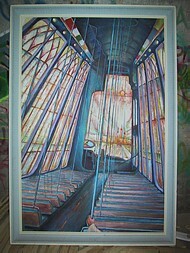 In 1988 Johnston went to work for Viacom, painting and working on billboards. Over the next 12 years he became known as one of the top pictorial painters in the industry. The job was to recreate designs that were submitted by ad agencies. The work contained all the elements of traditional painting, and was done with oils. Charlie discusses his billboard work through his career with Viacom with a certain satisfaction: "There would've been no other venue where I had that much opportunity to practice and exercise myself and work on that scale. . I loved doing large-scale portraits and the work challenged me artistically and technically and drove me. I've literally painted acres of pictorial work in these billboards. 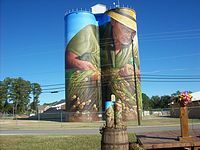 Hundreds of portraits, landscapes, architectural renderings, reproductions of other artists' works or designs, photo interpretive work, still life, graphics, you name it. Today, 98% of billboard art is gone. paint studios all over North America were closed in a very short time, replaced by digital print media. And then the art got lost for the most part. Except for those who transferred their talent to Murals. Charlie started his own company, C5 Artworks, which for him is a metaphor. The metaphor is an important one to him, as it's been a part of his own creative process. He explains: "As an artist, I'm a corporation. That is to say I have amalgamated into a singular organization. The act of self-incorporation is as much a creative act and spiritual attainment as it is a business venture to me because I've chosen to make it a symbolic gesture of the relationship between the material world and the spiritual one. To 'incorporate' can also be defined as the act of giving an abstract or nonmaterial concept a physical form, which is the essential task of an artist. I'm currently C5, which is my personal expression of the ultimate state of creative expression, the point were spiritual forces and material energy converge together." "To me the next level involves larger commissions; work on the grand scale for the world arena, but with greater artistic freedom. It's also about evolving Murals as an art form. I have this little litany my best work is going to be my next work. Each piece is an organic experience; nothing sits in isolation. Continuous learning is really important. Every time I do something I hope I'm learning something. Each time I work with new people, I draw from their experience, their perspective, as much as my own. It's not just painting the same painting over and over again like a printer. I like to treat my work as a place to explore and experiment, my own little laboratory." Charlie Johnston lives in Winnipeg with his partner Sarah and their children. 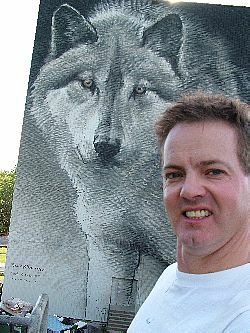 Click here to view Charlie Johnston's Winnipeg Murals.